Starting at the beginning of 2013, withholding for Social Security tax increased to 6.2% from 4.2% that an employee used to make in 2012 and 2011 years. This withholding is applied to income earned up to $113,700, according to IRS Notice 1036 (2013, January 3). For example, an individual with an income of $120,000 will experience a decrease in take home pay of $2,274 this year. This decrease in take home pay has a direct negative effect on consumption, and since consumption is the diving force of the Gross Domestic Product (GDP) in the US, it is important to try to understand the total effect of a 2% decrease in take home pay on the economy. As this paper will show, Social Security tax increase is likely to cause GDP to grow at around 1% in 2013. Timing of the increase in Social Security withholding is not favorable to current economic conditions. Households’ balance sheet remains weak due to relatively low home prices; stagnant wage growth; and a very low personal savings rate. According to the US Department of Commerce (2012, November), personal savings as a percentage of disposable income was only 3.6%. In order for consumption to remain unchanged, the savings rate will have to decline to 1.6% (3.6%-2%), holding everything else constant. Such a significant decline in savings is less likely at this time. The economy did not have enough time to recover from the 2008 financial crisis for households to recapture their wealth. 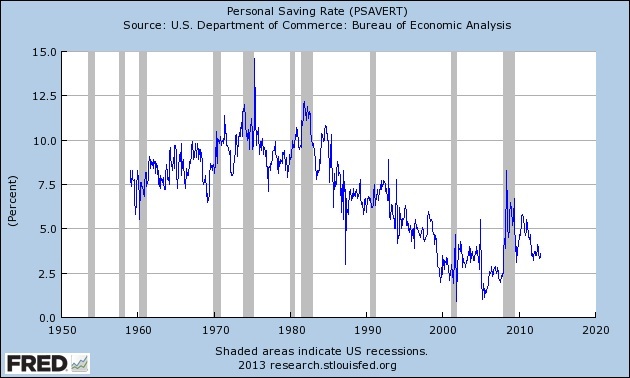 By looking at the Personal Savings Rate graph provided by FRED (2013), the savings rate tends to increase during a recession and decline during a recovery (see the graph below). Having a high savings rate provides an opportunity to increase spending and investments in the future. Since the current savings rate is only 3.6% and households’ wealth remains below the 2008 level due to weak and uncertain economic growth, households do not have much room or wiliness to increase spending and cut savings at this time. Having low desire and ability to cut savings, the expiration of Social Security tax reduction is likely to lower the consumption in 2013. Let’s assume that households will cut their consumption by 80% of lost income or by 1.6% of their paycheck (0.80*2%). In this case, the savings rate will also decline by the remaining 0.4% and will be at 3.2% in 2013. Since savings is a necessary component of future investments. The economy is going to experience a double negative effect on consumption in the short-term and investment in the long-term. Now, let’s estimate the dollar effect from the increase in Social Security tax withholding on the GDP growth in 2013. In 2011, median household income in the US was $50,054 and the total number of households was equal to 121,084,000, according to U.S. Department of Commerce (2012, September). Using this data, we can estimate the total median household earnings per year of $6,060,738,536,000 ($50,054*121,084,000). Assuming that consumer spending will decline by 1.6%, and consumption is about 70% of GDP, the direct negative effect on GDP will be a loss of $67,880,271,000 ($6,060,738,536,000*0.016*0.70). This may not look that bad considering the total GDP of $15,075,700,000,000 for 2011, according to data provided by the U.S. Department of Commerce. The direct negative effect is only 0.45% loss to GDP. However, due to a chain reaction of a decrease in spending by one person on the other people, we need to use a multiplier effect. Multiplier effect is equal to 1/(1-MPC). MPC stands for Marginal Propensity to Consume. Since the current savings rate is only 3.6%, and it is expected to decline to 3.2% (see explanation above), we assume MPC = 80%. The multiplier effect is 1/(1-0.80) = 5. Now, we are ready to calculate the total effect of increase in Social Security withholding on GDP, holding everything else constant. The total effect = 5*$67,880,271,000 = $339,401,355,000. As the result, expiration of Social Security tax reduction may decrease GDP by $339,401,355,000 in 2013. This decrease is equal to 2.14% of the total GDP ($339/$15,811=0.0214). The most recent annualized total GDP for the 2Q2012 was $15,811 billion, according to the U.S. Department of Commerce. Since the most current annualized GDP growth was 3.1% during the 3Q2012, expiration of Social Security tax may put a significant down pressure on further GDP growth in 2013. Looking at Social Security tax increase alone, the GDP is likely to grow at 1% during 2013. For future and more complete analysis of the US economy, it would be useful to look at a possible fiscal spending cuts as a result of a debt ceiling debate.